The Alzheimer’s Association International Conference (AAIC) is the largest annual scientific meeting with focus on Alzheimer disease (AD). More than 6,500 researchers and participants from pharma, academia, patent-advocacy organizations and other groups came together in Chicago between July 22nd and 26th to exchange the latest developments and research results. 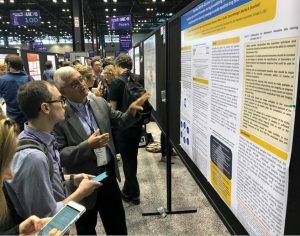 Both posters attracted significant attention and viewer traffic, and were well received by AAIC participants. Next year’s AAIC is scheduled for July 14-18, 2019 in Los Angeles, CA.